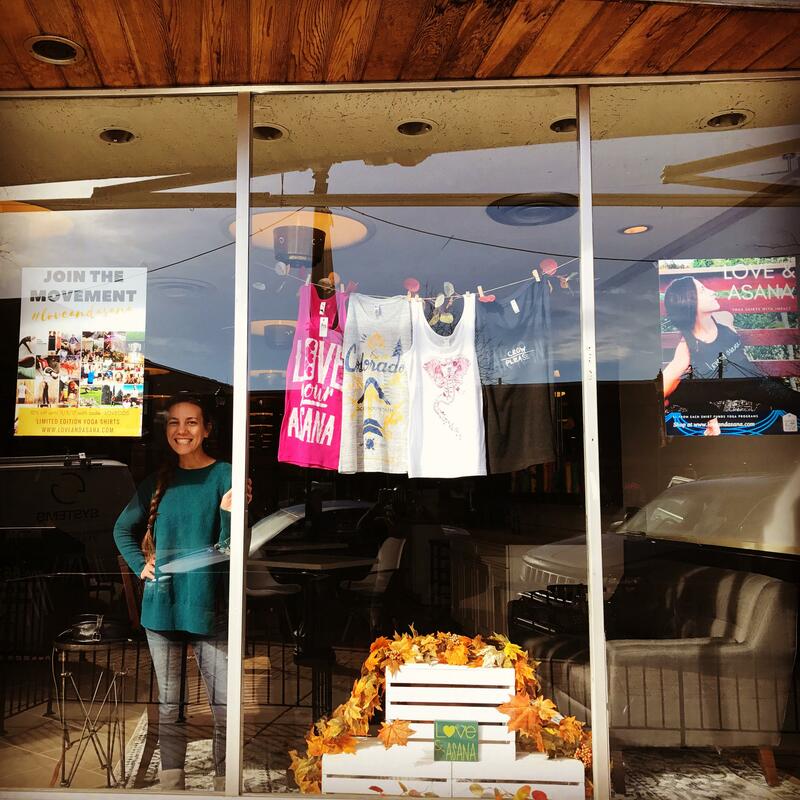 The newest Window2Startup pop up display in our storefront window features Love and Asana Yoga Apparel. Rim Technologies is pleased to support them for this event, which will run Oct. 24 – Nov. 5. Tiffany Lord, owner of Love & Asana Yoga Apparel, has her new line of apparel available in our store for the next two weeks or online in their shop. Check it out at Michelle’s Makery on 122 N. Tejon Street or go to www.loveandasana.com to browse their online selection and to learn more about the company. You can find yoga clothing and accessories for everyone. In addition, Love and Asana donates $5 from every purchase to the non-profit The Give Back Yoga Foundation, which offers programs for military veterans, cancer survivors, and eating disorder recovery. Tiffany Lord taught morning yoga classes at Michelle’s Makery earlier this summer. As a yoga instructor, she also brings workplace wellness events right to your company, along with offering private group yoga parties and recurring classes around town. If you’re interested in seeing some of her work in action, Tiffany has online yoga videos available for free. Explore her apparel line and course offerings at www.loveandasana.com.